Slow down and meet some manatees! Here’s how these peaceful animals spend their days. Click image for a closer view. One thing manatees are good at doing is nothing! These slow-moving mammals love lounging around. They spend 10 to 12 hours each day resting or sleeping. And when they need to come to the surface to breathe, they seem to be able to do it without fully waking up. Nice trick! When manatees aren’t sleeping, they’re usually busy with their other favorite activity: eating! Manatees munch mostly water plants. They eat them for breakfast, lunch, and dinner. A 1,000-pound manatee can eat at least 100 pounds of food each day. That’s like eating 400 cheeseburgers! A manatee has flexible lips that are good at grabbing plants. Rows of teeth in the back of its mouth grind food up. As the teeth wear down, they’re replaced by new teeth that move forward. In summer, manatees travel through the waters of Florida and other southern states. But sometimes they’ll go farther north—a few have even made it to New England, more than 1,200 miles away! Though manatees look roly-poly, they actually don’t have a lot of fat to keep them warm. So as winter approaches, they head back to the warm rivers and hot springs of Florida. They often hang out near electric power plants there. As the plants make electricity, they heat water. Afterward, the heated water goes out into the river. For the manatees, it’s like being in a hot tub! Manatees are some of the most peaceful creatures in the world. Some species of animals have “turf” that they may fight over with others of their kind. 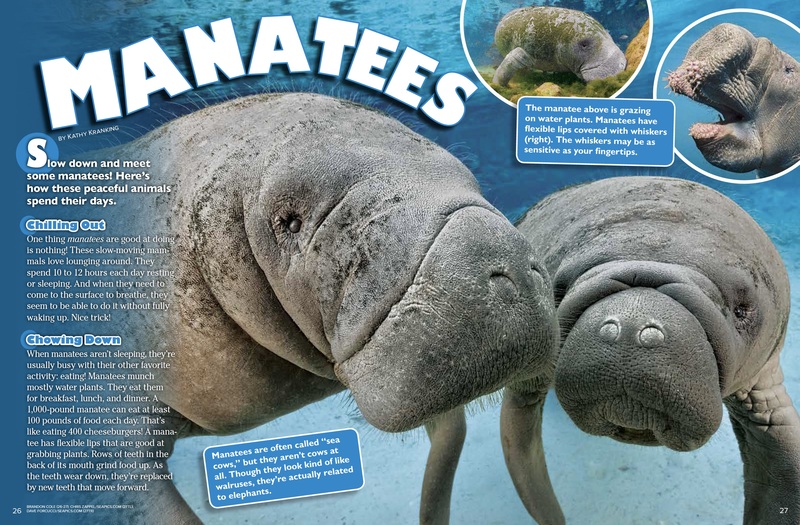 But manatees share their living spaces without squabbles. And manatees seem to enjoy each other’s company. Together, they play what seem to be “Follow the Leader” and other games. They also nuzzle noses, “hug” one another with their flippers, and greet each other with what look like kisses. Manatees even talk to one another, using squeaks, chirps, and grunts. Manatees seem to get along with people, too. Each year, lots of people come to Florida to see manatees. Some of the animals are shy and avoid swimmers. But many are very curious and will come right up to people. They may nuzzle them with their big, baggy lips—or even turn over for a belly rub! What’s cuter than a manatee? A baby manatee! 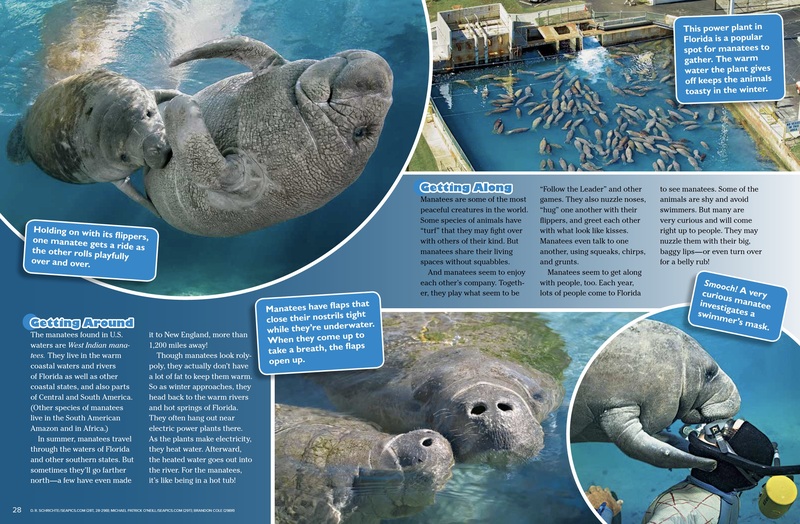 A manatee mom usually gives birth to one baby, called a calf. The calf drinks its mom’s rich, warm milk. When it’s a few weeks old, the calf begins munching on water plants, too. Its mom keeps nursing and caring for her baby for up to two years. Though people seem to love manatees, they’ve caused a lot of trouble for them, too: Manatees can get hit by speeding motorboats, caught in canal gates, and tangled in fishing lines and nets. 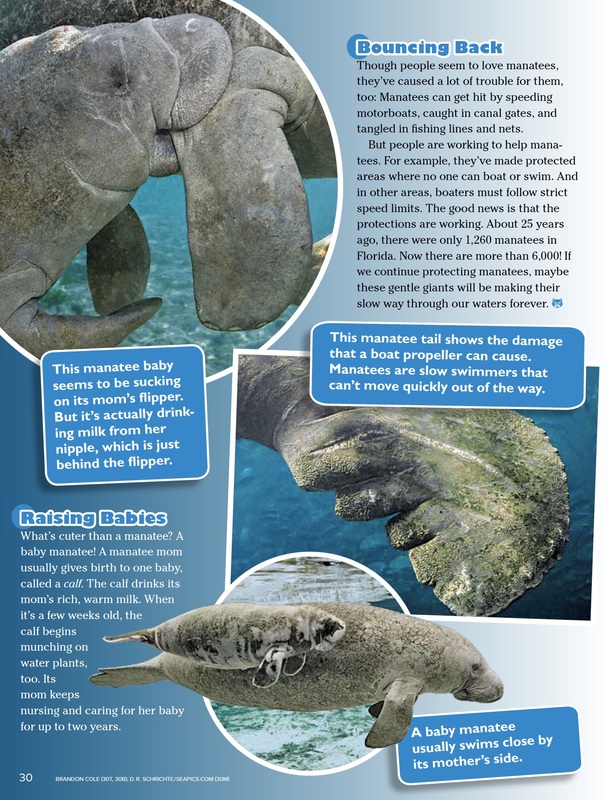 But people are working to help manatees. For example, they’ve made protected areas where no one can boat or swim. And in other areas, boaters must follow strict speed limits. The good news is that the protections are working. About 25 years ago, there were only 1,260 manatees in Florida. Now there are more than 6,000! If we continue protecting manatees, maybe these gentle giants will be making their slow way through our waters forever.